This tour is basically through trekking but consists of new untouched natural and local destinations over Caspian Sea and Hyrcanian forests. While enjoying excitement of Jeep safari in the wood to top heights, you will reach to excessively beautiful sights beneath the highest peak of Guilan with staying in local houses and having local foods. Ascending to Gorgeous Somamus peak is most prominent deal of second day and you will take day to the end with sleeping in a stone caravanserai in Lapasar which is unordinary enough to complete your voyage. Finally after crossing the ranges between Guilan and Mazandaran, it's time to take a breath from fresh heights of Javaher-Deh beyond mount Somamus in the last day of tour. The package is a semi trekking rout consisting of ascending to the highest peak of Guilan, Mount Somamus(3680m) and reaching to the other side of limestone mountain, Javaher-Deh summer region. The trip begins from Qasem Abad village by driving for one hour from Khayyat-Mahale to Javaher-Dasht using 4×4 Jeeps. After reaching the summer region above clouds and forest, you will stay in rural cottages and experience a different stay far from before. Having local food and relaxing for the night, we will start ascending to Somamus peak in early next morning. It takes 6-7 hours conquering summit. This trekking trail has gentle slopes in the beginning but the slopes get steeper eventually and are perfectly good for photography. 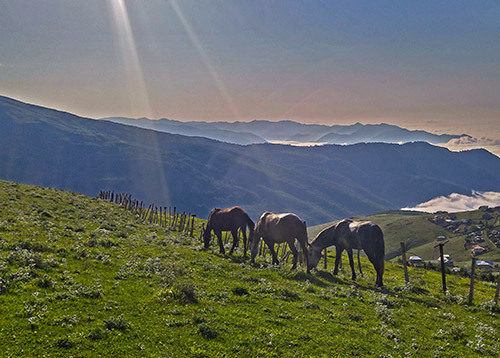 The higher altitudes offer a unique view of the Caspian Sea all the way to Chamkhale beach. Sometimes a blanket of fog covers the landscape and it appears as if you are walking over the clouds but then again the sun shines and the fog disappears. After conquering Somamus we will go ahead to Lapasar village that is still at heights and will have another unforgettable night and stay in Lapasar stone Caravanserai. Trekking to Javaher-Deh on the next day will stay in your memory as a trip crossing Guilan province and Mazandaran region.